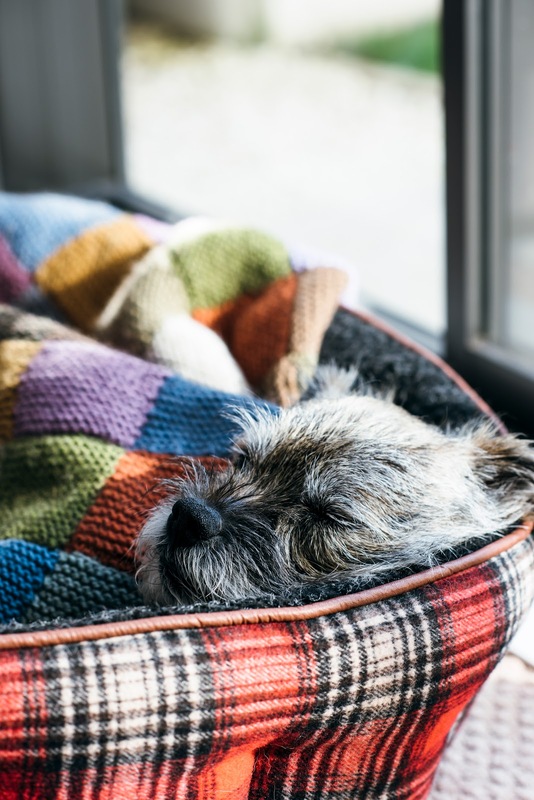 I’m writing this a bit later in the day for a change, coffee in hand, weak sunlight streaming in the window and, as hoped, Dougie is snoring gently and intermittently farting in his bed at my feet. (Dougie is Henry’s border terrier in case you weren’t sure!). He seems to be rocketing along with his recovery, eating well (free range chicken and rice…), taking his meds (kind of), sleeping lots but generally in a pretty perky state. The next step is to have his stitches removed next Wednesday and further blood tests to see if there is an underlying disease which caused his gallbladder issues. Meanwhile – it is all go in Melbourne with Pog finally starting his interior design course on Monday, and I am (fingers crossed) assuming not-much-news is good news from Rich. I started my day with a bloody lovely yoga session, so have no excuse not to now get my act together and have a good day, testing my next lot of recipes for Dish magazine. 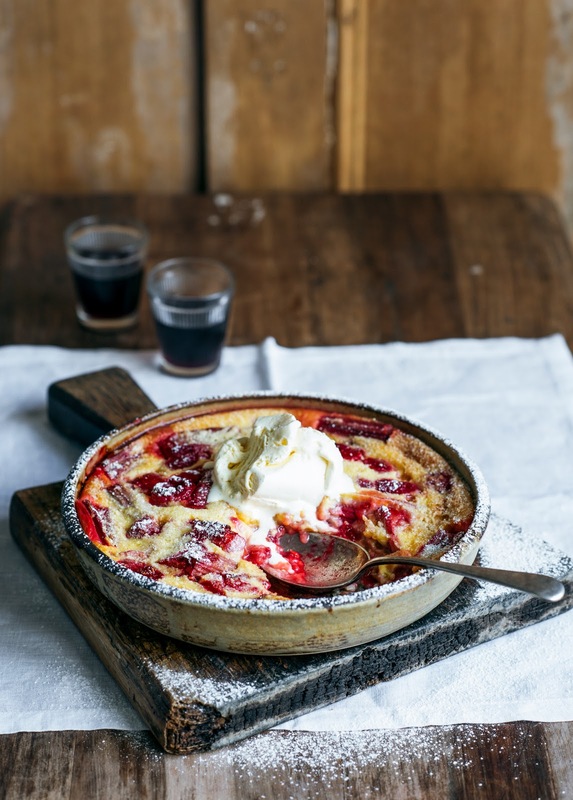 This clafoutis recipe is one I put together for my fortnightly Dish web contribution, and I have to say it is damned delicious. I love tart rhubarb, and when combined with the sweet raspberries then topped with soft vanilla custard it really is a great dessert. 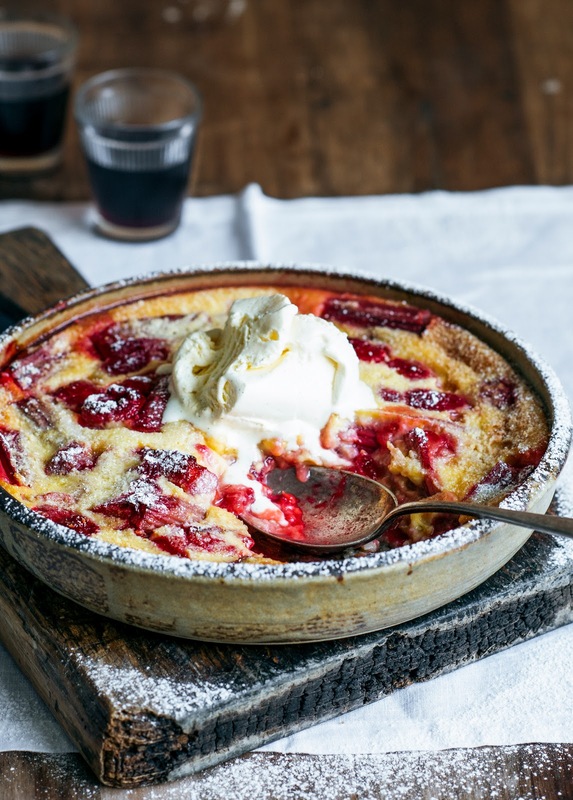 The clafoutis is super easy to make, and quick too, if you roast your rhubarb in advance. The trick is not to serve it straight away as the custard needs time to set up a little – but then don’t serve it cold either, because by then the custard will have set into a slab! Just give it 5 minutes or so, then serve with a lovely big scoop of vanilla bean ice cream. Preheat oven to 180˚C. Lay rhubarb in a single layer in the base of a large baking dish. Mix 2 tbsp sugar, 1 tsp of vanilla, zest and juice and pour over rhubarb, tossing gently to coat. Cover with tinfoil and bake for 12 minutes, or until just soft. Remove from the oven, add raspberries, toss gently and leave to combine and cool. These desserts are really not helping my waist line Sarah! Hi- If we don't have rhubarb available, how would it be with just the berries? Too sweet? Hi – Love the pie dish, where can I get it?